If you've experienced tooth loss as a result of tooth decay, gum disease or injury, it's important to replace the missing teeth to avoid additional problems, including a shift in your remaining teeth, a misaligned bite, and an older, sunken facial appearance. Whether you've lost some or all of your teeth, Mendelson Family Dentistry, PA can provide removable dentures that can restore your smile, boost your self-esteem and improve your health. 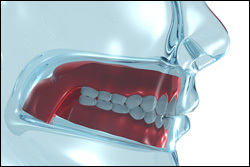 Dentures are a set of replacement teeth for any teeth that are missing. When healthy teeth remain, there are partial dentures, which take the place of only a few teeth and prevent the others from shifting position. If all teeth have been lost, there are complete dentures for replacing an entire set of teeth, which can include upper dentures, lower dentures or both. Both full and partial dentures improve your ability to chew and speak, while supporting facial muscles and enhancing appearance. Advancements in dental technology are creating dentures that are more comfortable, more durable and better fitting than ever before. At Mendelson Family Dentistry, PA, we can custom design dentures that not only replace teeth, but ensure the best possible fit, function and comfort for your jaw and bite. The loss of one tooth or many teeth can be devastating, but it doesn't have to be permanent. The condition and severity of your remaining teeth will determine the type of denture that will best address your needs. Visit our Owings Mills office for an examination, and we'll work with you to determine the best treatment plan for you.